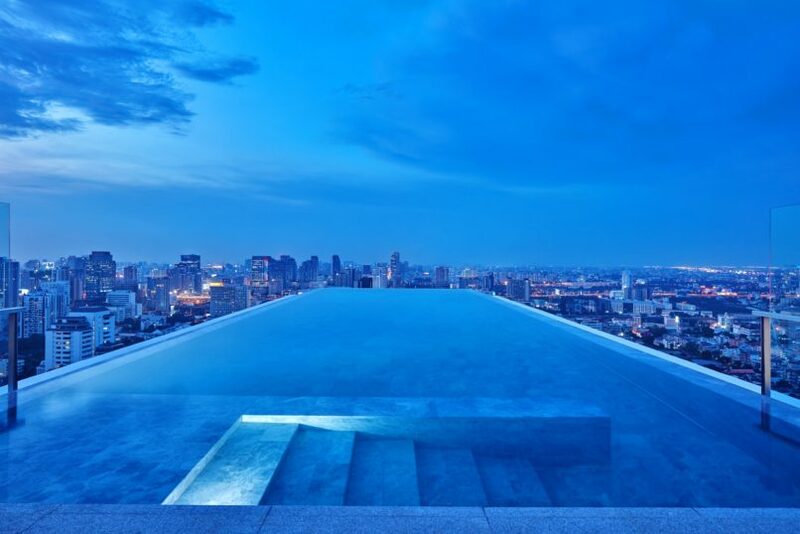 The rooftop pool to conquer all rooftop pools. But there’s much more to 137 Pillars than swimming pools to enjoy. A quiet oasis in the centre of the bustling city, this 28-storey hotel, which has a sister property in Chiang Mai, offers a uniquely Thai brand of luxury hospitality as well as two entirely different categories of accommodations for travellers to choose from, but more on that later. All you need to know for now is that 137 Pillars has plenty of outstanding aspects that make it a top pick for your next stay in Bangkok. The lobby at 137 Pillars Suites & Residences Bangkok. Located just minutes away from the EmQuartier shopping mall and the Phrom Pong BTS station, the hotel sits midway between the shopping of Siam and the nightlife of Thonglor. The immediate surroundings are quieter and more residential than other nearby areas, but the action is never too far away. 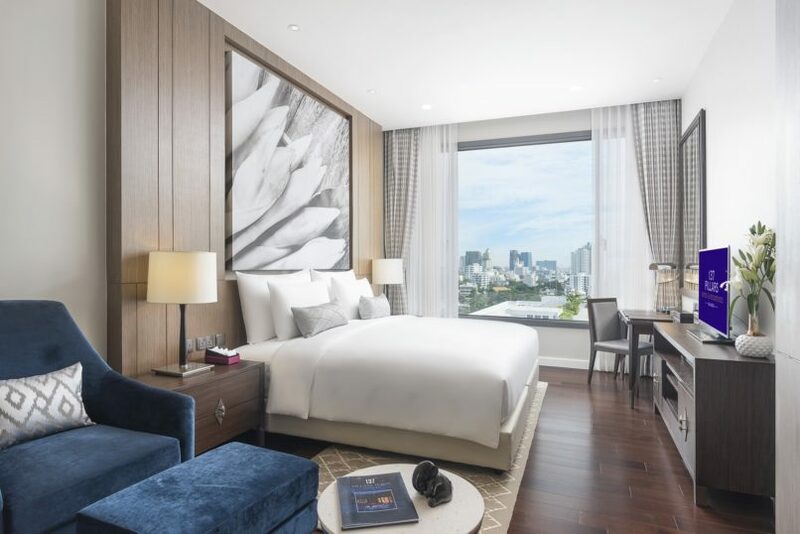 In terms of getting to and from airports, the hotel is about a 40-minute drive away from both Suvarnabhumi and Don Mueang, though you should allow more time for traffic — as is always the case in Bangkok. The living room inside an Ayutthaya Suite. 137 Pillars Residences & Suites is so named because it offers guests two types of accommodations. On the top floors are 34 luxurious, extravagantly designed suites; below that, 176 serviced residences take up the rest of the hotel. 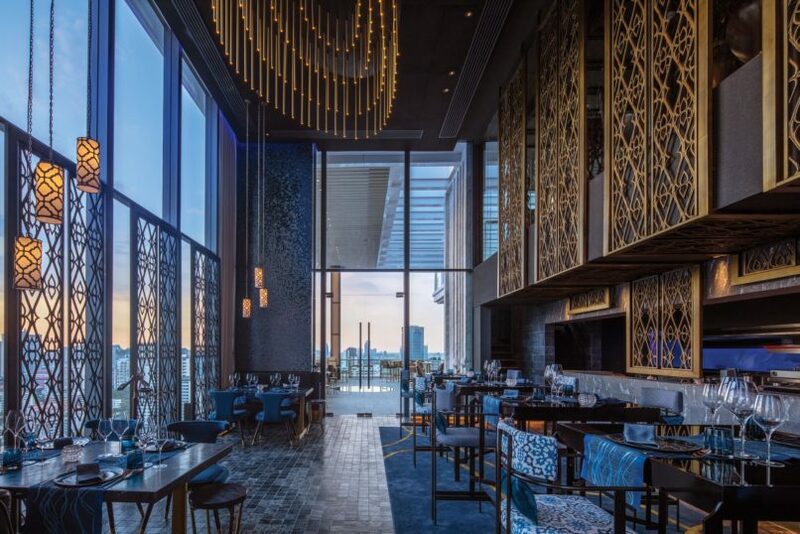 Guests staying in suites have exclusive access to the Leonowens Club lounge on level 26 as well as the rooftop, featuring the iconic infinity pool with uninterrupted 360-degree views of Bangkok. Ranging from 70 to 127 square metres, all suites feature butler service, in-room private wine cellars with maxi bars, beautiful marble bathroom with circular tubs, Bose sound systems, Posturepedic Ultra Plush beds covered with 400-thread-count Egyptian cotton linens, and spacious balconies with stellar views of the surrounding skyline. I stayed in a 95-square-metre Ayutthaya Suite and was immediately impressed by the bold décor, high ceilings, stunning bathroom, walk-in wardrobe and spacious balcony — perfect for chilling out after hectic days spent running around Bangkok. However, the best part of staying in the suite was the access it afforded me to the private gym and the rooftop pool, which I had all to myself on more than one occasion. One of the bedrooms inside The Pillars Executive Two Bedroom Residence. I didn’t stay in any of the residences, but a quick tour left me with the impression that they would be best suited to business travellers, families or extended-stay guests. Toned down in terms of décor, the residences feel more subdued and less flashy, and they offer more of a feeling of being at home thanks to their fully outfitted kitchens and dining tables. Whereas the suites scream luxurious holiday, the residences convey a calm and refined cosiness. The dining room of Nimtir. 137 Pillars offers a nice range of F&B options with enough variety to keep guests from getting bored. Suite guests have exclusive access to the rooftop Sky Bar for cocktails, fresh juices, light refreshments, as well as daily breakfast, afternoon tea and pre-dinner cocktails at the Leonowens Club. 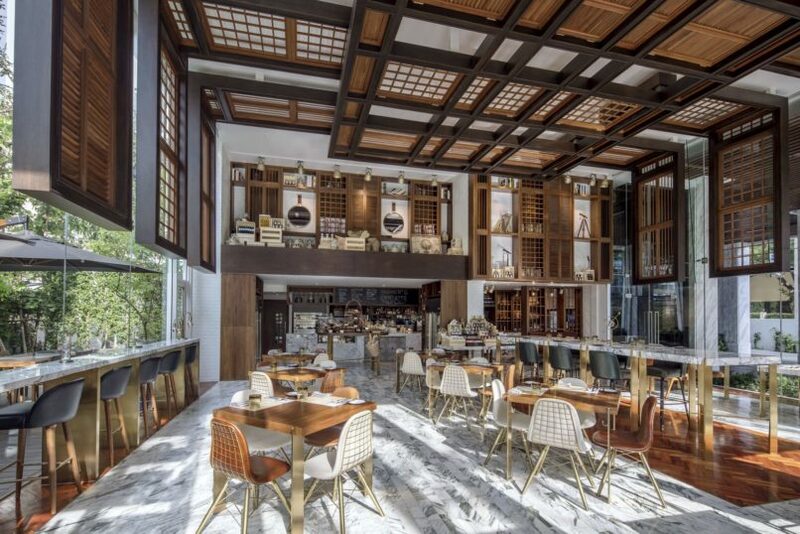 Restaurants include Nimtir, which means “dream” in Thai and serves a menu of “responsible Oriental gastronomy”; and Bangkok Trading Post Bistro & Deli, a ground-floor eatery serving an eclectic menu of Eastern and Western dishes in a high-ceilinged, convivial space. On level 28, Jack Bain’s Bar specialises in whisky and cigars in a handsomely designed space, but the standout option is Marble Bar, where you can sip wine and cocktails while enjoying the alfresco vibes and stunning views. The rooftop pool, available exclusively to suite guests. As mentioned above, suite guests enjoy exclusive access to the rooftop infinity pool as well as a separate gym; guests of the residences have access to a fitness centre and a different infinity pool on level 27, which is very nice but lacks only in the sense that it doesn’t have 360-degree views. If you can live with that, you’ll have nothing to complain about. There’s also a large Jacuzzi next to this pool, which you can have a soak in before or after cocktails at the adjacent Marble Bar. 137 Pillars is also home to Nitra Spa & Wellness, offering a full range of treatments and holistic therapies. Guests can also take advantage of a state-of-the-art indoor golf simulator as well as an outdoor putting green and driving range area on level 6. 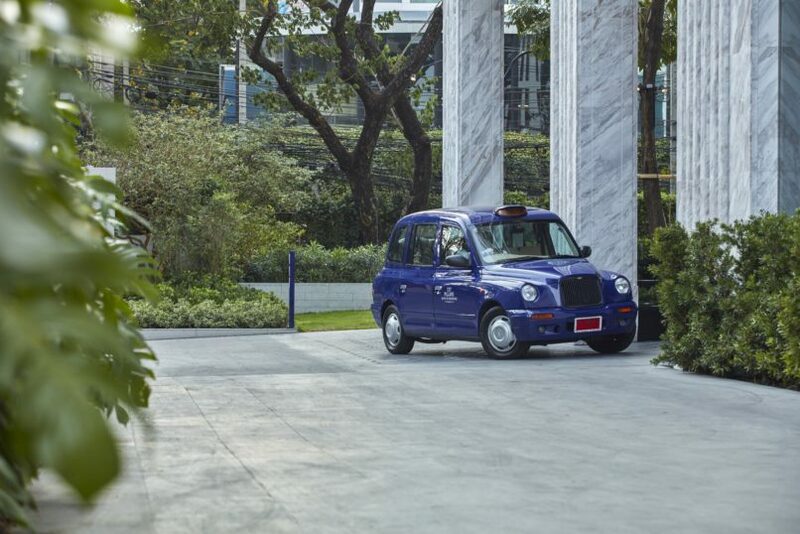 A royal blue, London-style cab shuttles guests to and fro. It would be hard to miss the royal blue London cab parked outside the hotel. Its name is Louie, and its purpose is to shuttle guests from the hotel to the BTS. That’s a whole lot nicer than a tuk tuk, I’d say. Inside Bangkok Trading Post Bistro & Deli. I spend quite a lot of time in Bangkok, and I often find myself in big-chain properties that, while nice, don’t feel very unique. 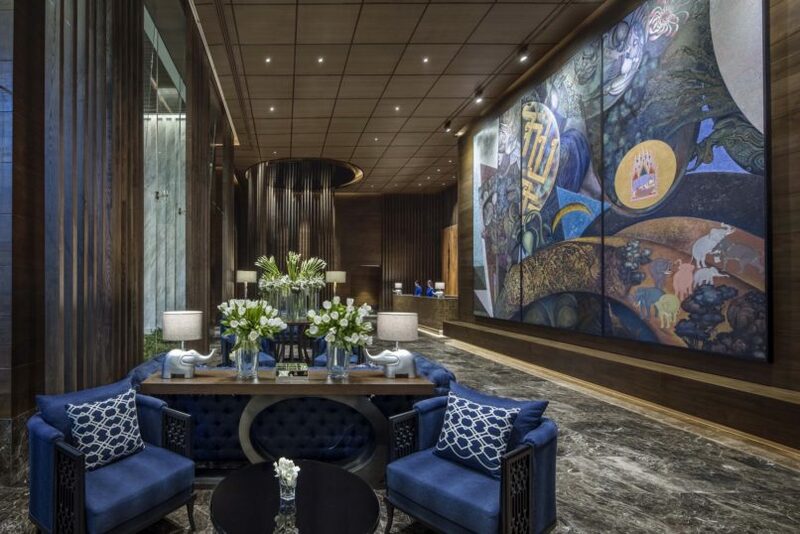 That’s not the case at 137 Pillars Suites & Residences, which stands out the moment you walk into the lobby and see walls adorned with Thai artwork and continues throughout your stay as you experience the friendly, flawless service. More than anything, this property had loads of character, which is too often missing at those big-name properties. Given its convenient location, lavish suites, strong F&B options, top-notch service and excellent facilities — that pool! 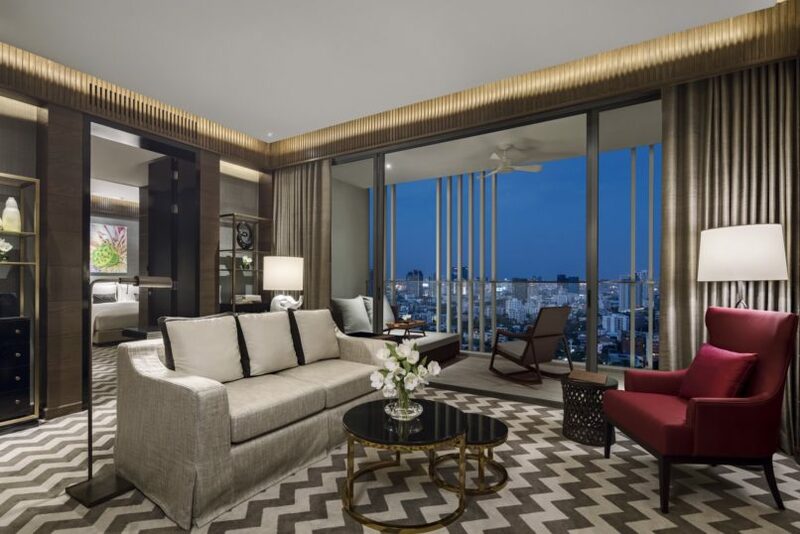 — I’d strongly suggest you consider staying at 137 Pillars Residences & Suites when you go to Bangkok. If you’re anything like me, you just might find it difficult to check out.